The Santa Barbara Zoo tradition summons the flakes, fun. 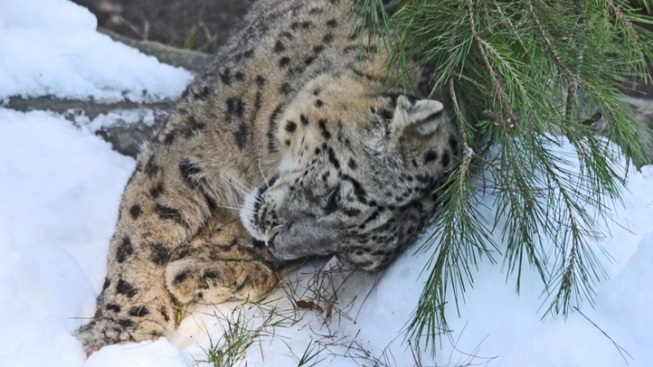 The Santa Barbara Zoo Snow Leopards'll frolic in the frosty white stuff on Sunday, Dec. 7. A DIFFERENCE A WEEK MAKES: The weather on Thanksgiving Day 2014, for much of the Golden State, was pretty golden, and even downright warm. The sunshine was on the toasty side, the breezes flirted with balminess, and thoughts of snow were far from our nicely warmed minds. At least thoughts of snow near the coast, but some 80 tons of the brrr-nice cold stuff will make for that unlikely destination, or near it, at least, on Sunday, Dec. 7. That's when the Santa Barbara Zoo celebrates its magnificent Snow Leopards, and all snow-loving people and animals, with an afternoon devoted to frosty flakes and the frolicsome fun one can have while crunching around in frozen water. Are Snow Leopards "frolicsome," though? We assert that they are, even if they twitch their tails as look out from their perches with a royal nature. WHERE THE SNOW WILL GO: Some of the trucked-in flakes will head straight for where the Snow Leopards live at the zoo -- this is, after all, their festival, by name -- but some will be saved for the human kids, to sled down and make snowmen. But other animals around the animal park will get a crack at the one-day-only snowy fun, from the meerkats to the otters to the beasties of the barnyard. Question: Do animals have their own "moo" or "bark" or "roar" to define when snow starts to follow? Our co-earthlings share so much information that surely they're able to express opinions on their environment, and its immediate changes, as well. Science, please continue to explore this. BUT UNTIL... we know the meerkat word for "snow" we'll make for Santa Barbara for an all-too-rare, not far from the Pacific snow day. The zoo, by the by, "supports field conservation by the Snow Leopard Trust," so if you'd like to know more about that, ask when you arrive or put your paws on this site.